Summary: One of the many oddities of this cycle is that many things that were good during the post-WW2 era have become bad in the new era now starting (unrecognizably so, as we remain unaware of our changed circumstances). Like debt. As we see with auto loans, once useful — now malignant. Our use of debt also gives clues to our future. During the post-WW2 era increasing debt supercharged economic growth for the young and rapidly-growing West. But after 60 years of this our societies now carry massive debt loads, both public and private — while the numbers of elderly grow (who experience a crash of income upon retirement, plus rising costs to society for their pensions and health care). 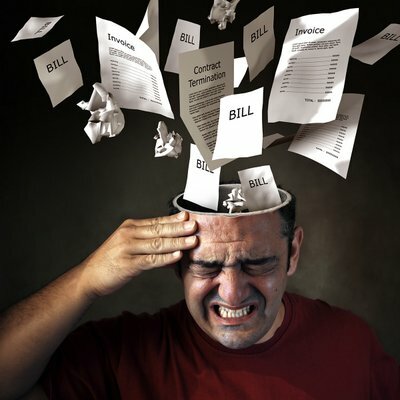 Carrying our current load might prove difficult; adding to it now is madness. Plus, there are other factors in play. Fifty years of growing inequality, for still poorly-understood reasons, have hollowed out the middle class — diminishing their ability to carry their existing debt, making them dependent on borrowing to maintain their lifestyle. Some take another step beyond borrowing. Borrowing to buy cars and homes results in slowly accumulating equity, one of the most common ways middle class households save. Increasingly Americans abandon buying with debt for renting. Rent homes instead of owning. Renting cars (leasing) instead of owning. Accelerating borrowing was a natural leading indicator of economic recoveries during the post-WW2 era. So economists see the waves of desperate borrowing by consumers since 2000 as a good thing. Hence their excitement about the subprime lending boom that drove the housing bubble. Such as today’s subprime borrowing to buy cars. The extreme case of this blindness to our changed conditions is glee about the shift to renting cars (aka leasing). It shows vibrant demand for cars! As we see in this excerpt from a report by BofA-Merrill global economist Ethan Harris, 6 August 2014, showing that after mid-2012 leasing grew faster than total spending on vehicles (2012 saw many such transition points for the US economy). Household outlays on leasing are booming at a 20% yoy pace — a clear sign that demand for vehicles is alive and kicking. With average lease payments lower than typical monthly ownership costs and with a down-payment not typically required to enter into a lease, the surge in vehicle leasing is likely a sign that financial restraints are still holding back some would-be buyers. Thus, as the economy improves, bottled-up household demand for vehicles could translate to higher sales. Yes, in our society demand is “alive and kicking” by subprime households for cars bought with low-rate loans on easy terms — or even just renting (aka leasing). But does it point to an economic recovery — or exhaustion? Turning back to people at least attempting to buy, there are four dimensions to consumer loans: the creditworthiness of the borrower, the interest rate of the loan, the length of the loan, and the collateral (the loan to value ratio). A report by Experian Automotive, 2 June 2014, describes the first three. The average amount financed for a new vehicle loan also reached an all-time high of $27,612 in Q1 2014, up $964 from the previous year. In addition, the average monthly payment for a new vehicle loan reached its highest point on record at $474 in Q1 2014, up from $459 in Q1 2013. … Market share for nonprime, subprime and deep subprime new vehicle loans in Q1 2014 rose to 34%. Six and seven year long auto loans! At what point will the borrower have equity in their cars? 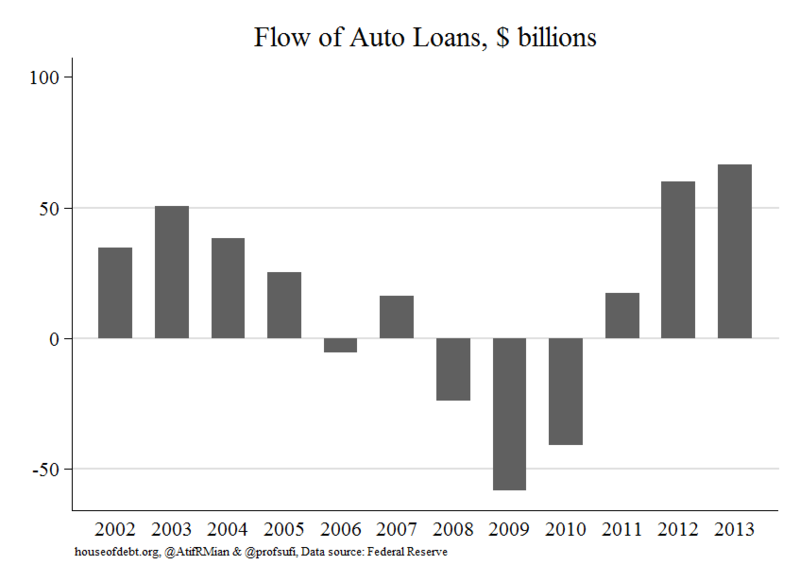 Especially since these are probably the subprime borrowers that make up 1/3 of auto lending. (4) Why are these numbers important? The changing nature of auto sales tell us much about ourselves. They show how economists do not see the new era beginning. They imply slower growth in the future, as a household’s longer loans with smaller downpayments push out their ability to buy their next car. They tell us something about the recovery. 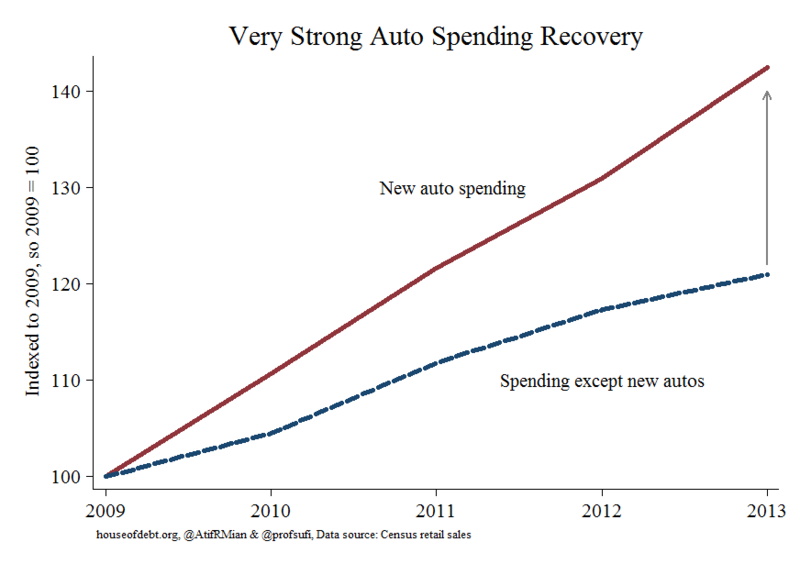 Second, since the crash auto sales have grown much faster than overall consumer spending. (a) “Just Released: Looking under the Hood of the Subprime Auto Lending Market“, New York Fed, 14 August 2014 — Reassuring words from the Fed, just like their analysis about subprime mortages in 2006-07. Previous Post Why did we elect Obama, “the World’s Most Important Spectator”? Next Post The debate about climate change takes a new form. One familiar yet disturbing. On the other hand, you also post articles to the effect that current American politics resemble the end of the Republic and the beginning of the principate. However, the principate was not, for Rome, a bleak, dubious economic time. Augustus famously found Rome brick and left it marble. Julius Ceasar, crossing the Rubicon, was returning victorious, not defeated. While Romans lost their liberty, they lived well. There are disturbing authoritarian impulses current in America today. But no bread and circuses. I do not understand the nature of your comment. Patterns from history are not like suits of armor. They’re a collidiscop. Everything from history is repetition, but varying in magnitudes and combinations. Historical analogies help us understand the past, but they’re not like playback of a CD. To mention just one factor, the people of the past are aliens. That is the important lesson from the “study of everyday life in the past” begun on a large scale in the 1980s, one of the great intellectual breakthroughs of our time. rentier class who controlled the Senate and pressed to enforce onerous terms of debts they had extended to desperate borrowers. Refusal to take haircuts and write downs destroyed the Roman Empire just as it threatens to destroy us today. While I like Hudson’s work, that is a somewhat specious claim — on several levels. Broadly speaking all urban societies have had a powerful “rentier” class. There are probably some rate exceptions, but I cannot think of any. In another sense, pre-modern societies (pre-1700 in Europe, later in other regions) don’t have the economic structures that creates “rentiers” in the usual sense of the term. Third, attributing the fall of Rome to rentiers to any serious degree is IMO ridiculous. Such a large event had many causes — infection by Christianity (Gibbon’s favorite), low fertility, lead, etc. But rentiers is, I believe, far down on the list of most experts in the field. Also, I think the a Roman Empire is a poor analogy to the US today. Such large phenomena allow the construction of unlimited analogies, but IMO the differences are too great to be meaningful. The decay of the a Roman Republic — specifically the political structure — has, IMO, some lessons for us (despite the many differences). There are similarities, which the Founders were well aware of. Correction – my comment was directed to Peter, not Duncan. I find his thesis compelling. Certainly an entertaining read. Thanks for the link! Hudson is imo always interesting to read. This meme of creditors over pressing their advantage in a very off putting way is gaining attention from the likes of Joseph Stiglitz who is more mainstream than Hudson. You know the end game has started when roaches like Singer show up on the geopolitical kitchen floor with Harvard intellectuals shining their spot light on these ugly critters. This buttresses my hope for the future based on the disinfectant power of the internet. For the first time in human history we average joes can see the ugliness in real time. Hopefully this will soon take the fun out of being an oligarch. Just as with the housing bubble, it’s all about focusing the borrower on how much car he/she can buy for a given monthly payment, and nothing else that sensible financial decisions normally entail. I believe the reasons for the past 50 years of growing inequality are quite well understood, and you yourself have discussed them many, many times in previous posts. That’s a great point. I expressed it poorly. I believe the causes are largely known, but these are still controversial. Conservatives denied for years there even was increasing inequality of income, despite the clear and growing evidence. Now they’ve moved to secondary trenches: the causes are unknown, and it doesn’t matter. There is no such thing as building equity in an automobile. A new car begins to drop in value at the moment of its sale and continues to decline in value until it reaches a very low trade-in value. When the loan is paid off, the car has equity. Arithmetic. Reassuring words from the Fed, just like their analysis about subprime mortages in 2006-07. This note looks at credit scores, but ignores falling loan-to-value ratios and lengthening loan lengths — and so draws sunny conclusions.